KANNAPOLIS, N.C.-On a dreary Tuesday night at Intimidators Stadium supported by Atrium Health, the Kannapolis Intimidators failed to take the first game of the now two-game series with the Delmarva Shorebirds, losing 8-5 in 10 innings. Kannapolis' Kade McClure made his return to the mound for the first time since his season-ending knee injury last year. McClure seemed to pick up right where he left off, striking out seven Delmarva batters, walking two, and allowing only three hits over four innings of work. Shorebirds starter, Ofelky Peralta, allowed four hits and one run. Peralta recorded every out himself in the first three innings of the game, including striking out 10 Intimidators in his 3.2 innings pitched. Kannapolis jumped out to an early lead in the bottom half of the first inning, when Bryce Bush singled, scoring Steele Walker from second. Bush finished the night with his second multi-hit game of the young season. In total, the Intimidators brought in four pitchers in relief of McClure. RHP Vince Arobio was nearly perfect over his two innings of work, striking out four and walking one. Wilber Perez followed Arobio on the bump, throwing his way to his first hold of the new season. Perez then handed the reins to tall RHP Lane Ramsey (0-1). Ramsey struggled to keep his control, ending with three wild pitches and giving up seven runs, six earned, and walking two in the 9th and 10th innings. Delmarva's offense rallied in the ninth after trailing for most of the game, led by a three-run home run by Robert Neustrom. The Shorebirds then found success in the 10th, scoring four runs before Kannapolis could record an out. 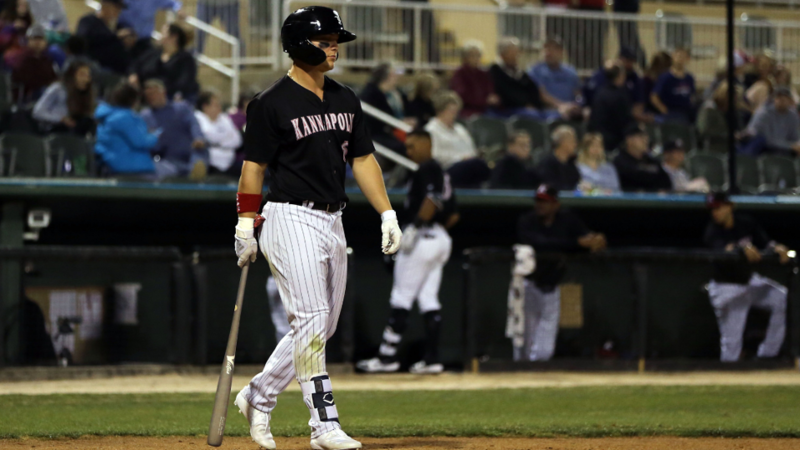 The Intimidators will look to bounce back from the tough loss Wednesday morning in the final game of the series with the Delmarva Shorebirds. First pitch is set for 10:35 a.m. with Jonathan Stiever taking the hill against Delmarva's Hector Guance. Fans can purchase tickets for the Education Day tilt by visiting intimidatorsbaseball.com or stopping by the F&M Bank Box Office located at Intimidators Stadium supported by Atrium Health.